Based in Billingshurst, Class Cover is a recruitment agency that supplies teachers to primary and secondary schools. We were called to sort out a couple of problems. Their offices were cramped and they wanted to maximise the available space and wanted to rebrand. Steve Waghorne, our Design Director, was commissioned to come up with a new concept design based on those two ideas which had to be fun and functional. Our first objective was to analyse what was wrong with the functional layout. The offices occupied two floors: Ground and First. The Ground floor required remodelling as the current WCs were unisex and were too small. They wanted two separate WCs (male and female) which were larger. We also had to take into consideration the redesign of an enclosed kitchen, boardroom and communal break-out / eating area. The idea for the Ground floor was to use it as an informal area. The Operations department was on the First Floor. One noticeable problem was that they had a sales team of around four people who were operating close to the Accounts and Finance teams. As imagined salespeople deal with sales calls every day and generally make noise. It was concluded that their proximity to the quieter teams was detrimental to the work output. It was important therefore to come up with a solution to isolate the sales team while allowing them to have visual contact with other members of staff. We responded to the brief by coming up with different solutions for the directors to mull over. The concept plans outlined at the bottom of the page illustrate our concept ideas. After analysing the space, Steve used his many years of experience, and was able to come up with many exciting options! The branding itself was a very important part of the design, which had to be addressed as it was non-existent. Steve put forward the idea of bringing the brand into the workplace making it a more vibrant, airy place to work in. It was about communicating the company values to both the client and the candidate, showing its market positioning, levels and quality of service. Using the three predominant colours of the logo (mauve, turquoise blue and white) we were able to create a snazzy but sharp colour scheme for the work environment that was also fun. 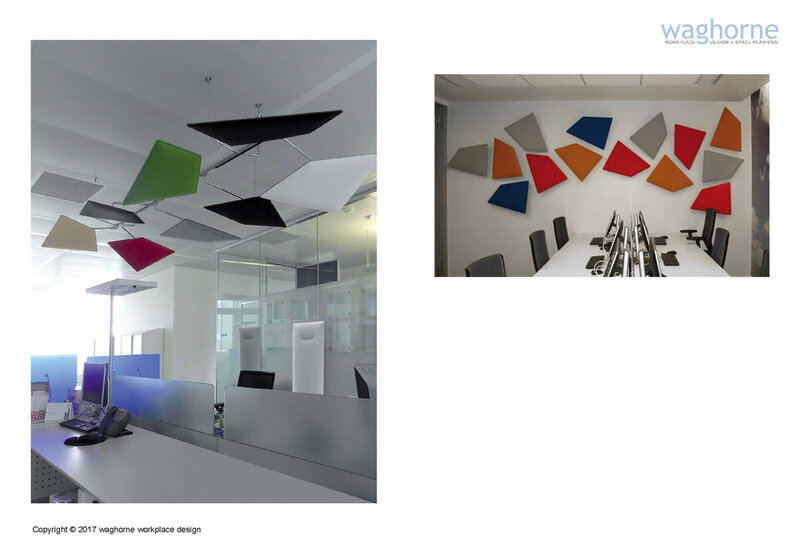 We decided to brighten up the offices with colourful furniture downstairs; we thought about the noise alleviation in terms of sound acoustics and the different available solutions. We introduced the idea of sit-stand desks to energise staff and reduce sedentary hours. As a link idea to schools a blackboard was introduced, replacing the old boring notice board, for people to join in with their ideas and be inspired to brainstorm. Branding was further reflected by the choice of quality carpet. Fun and innovation were the talk of the day. We feel that this is one of the most exciting projects we’ve worked on as we had total creative freedom.